Lost Coast Outpost reports that former Wiyot Tribal Chair Cheryl Seidner is throwing her hat in. 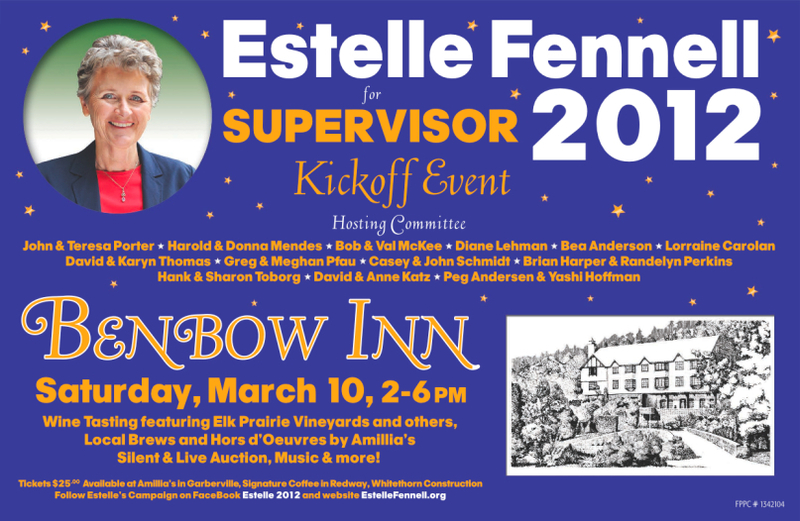 A very strong candidate, but she’s over a hundred grand behind in fundraising by now. But all of the sudden nothing seems inevitable. Kym has a post with some photos and a thread of great stories. I’ll have something to say when I gather my thoughts. His devoted son spent a lot of time over the past few months driving to and from Tacoma. My heart goes out to him and other family. Not the popular dodging of the Vietnam War, but the almost universally condemned dodging during World War Two – where war opposition was mostly limited to pro-fascists, crypto-isolationists, absolute pacifists, and dogmatic Trotskyists. This man, Noboru Taguma nicknamed “Sonny Boy,” did not fit into any of these categories, and I suspect that few would begrudge his position today, even if they disagree with it. In fact, he didn’t really oppose the war. When Noboru received his draft notice after being in the camps for two years, he refused. He did not need a college degree or a sophisticated understanding of the Constitution to take an impressive stand for the rights of citizenship and to demand some respect for his parents. If his parents were freed from the camps and allowed to go back to their farm in California, he would serve proudly, but until then, he refused. He was one of the first Nisei to refuse the draft. Even though James Omura, later defender of the Heart Mountain Fair Play Committee, suggested that these first Nisei were rash in their arguments and too disorganized to make a difference, Taguma did not back down. The JACL leaders, most notably Min Yasui and Joe Grant Masaoka, came to see Noboru Taguma and the other first four resisters in an effort to convince them to give up the fight. As Taguma recalled, “the JACL say, sacrifice your life to prove your loyalty.” But that was just crazy in Noboru’s mind. “We were loyal to America,” he said, “but the government itself was un-loyal to us.” With the support of his father, who urged him to stick with whatever decision he made, Noboru Taguma resisted the draft and later renounced his citizenship in an effort to bring the family together and to get them to Tule Lake – a little closer to home than Granada, Colorado. 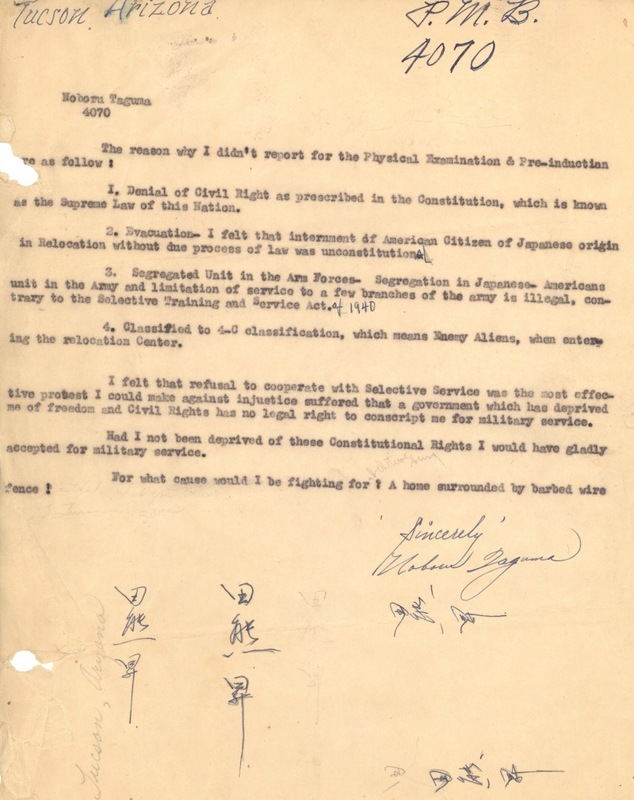 Despite the fact that Taguma’s efforts to reunite the family did not work out as planned, and despite the fact that the JACL did not recognize his principled resistance until 2002, Taguma knew that he did the right thing in standing up against injustice during the war. Salt of the Earth, and among those few who can claim credit for having pulled us away from the brink of self-destruction, just by being who he was. Addendum: Thanks to Mitch who found a link to Taguma’s obit, and a pdf of his letter to, I guess whatever was the contemporary counterpart to the Selective Service Administration. There’s also a photo of Taguma through Mitch’s link in the thread. Ernie tells the story and and some of his own thoughts on the incident. It’s being reported on Eric Kirk’s blog. I heard that on the radio this morning, so I figured I’d better make it come true. Actually, it was reported by Hank yesterday. Wasn’t it called The Day After Tomorrow or something? 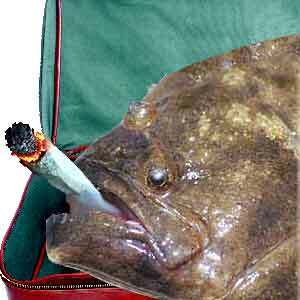 The impact of marijuana on fish. That will be the topic on the Environment Show on KMUD tonight from 7 to 8. Hank reports. From her campaign. I’m pretty sure it gets bigger if you click on it. Newt’s latest words of wisdom. The culture wars have long since moved from lattes and arugula. Cars and light bulbs are the new front. Did you know that hippies killed the Hummer? I heard it on the radio.